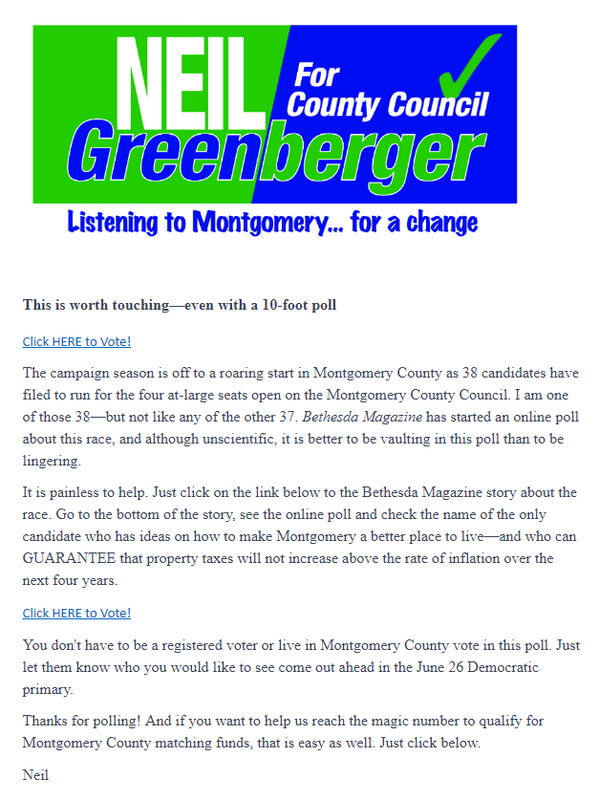 Who is Voting for Neil Greenberger? 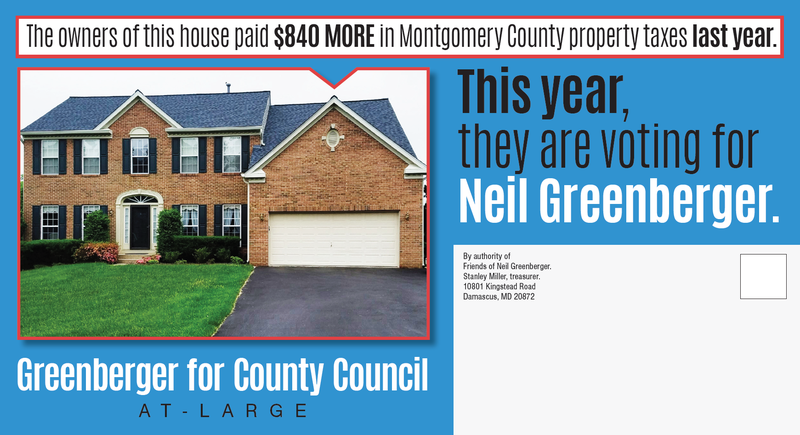 At least one homeowner is voting for Council At-Large candidate Neil Greenberger and he printed a picture of the person’s house on his first mailer. 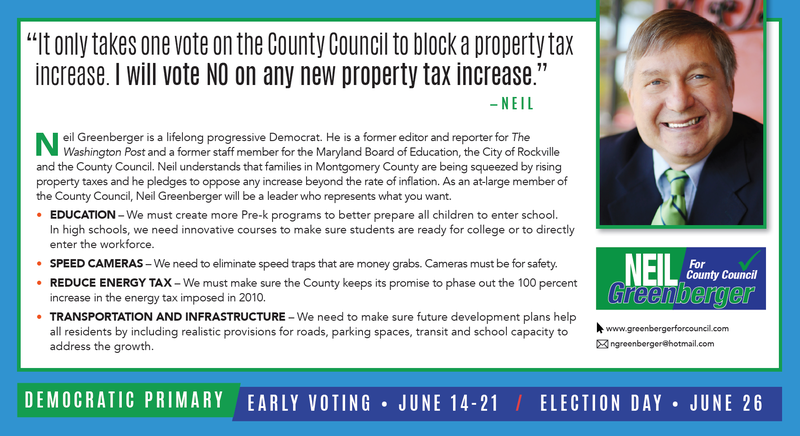 To our knowledge, Greenberger is the only Democratic Council At-Large candidate to guarantee that there will be no property tax hike if he is elected. That’s because the county’s charter requires that all nine Council Members must vote to increase property tax collections above the rate of inflation and Greenberger promises to vote no. Back in the days of Maryland Politics Watch, we would occasionally set up online polls for various races. The polls had no validity, of course. They could not screen for registered voters, much less those in a particular party or county, and even those that limited each IP address to one vote could be easily gamed through multiple devices and masking software. But we did it anyway for two reasons. First, we were greatly entertained by the thought of frenzied candidates snapping the whip over armies of interns and yelling, “Vote faster! You’re not pushing the vote button fast enough! !” And second, they got lots of eyeballs, or at least apparent eyeballs. Your author once scrutinized the traffic coming into one of our better performing online polls and discovered that most of it was coming from a handful of IP addresses. Eventually, we stopped. The “polls” added no value to the readers’ understanding of the elections. And they also turned into a huge waste of time for candidates. 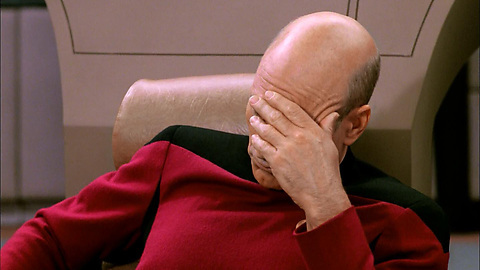 After we posted yet another online poll in 2010, one candidate emailed and said, “I really hate these things. I have to drop everything and start voting!” We took that comment to heart. From that point on, your author determined that it was only worth doing a poll if we could invest it with some kind of methodological validity. That’s easier said than done with an online poll! That has not stopped others. 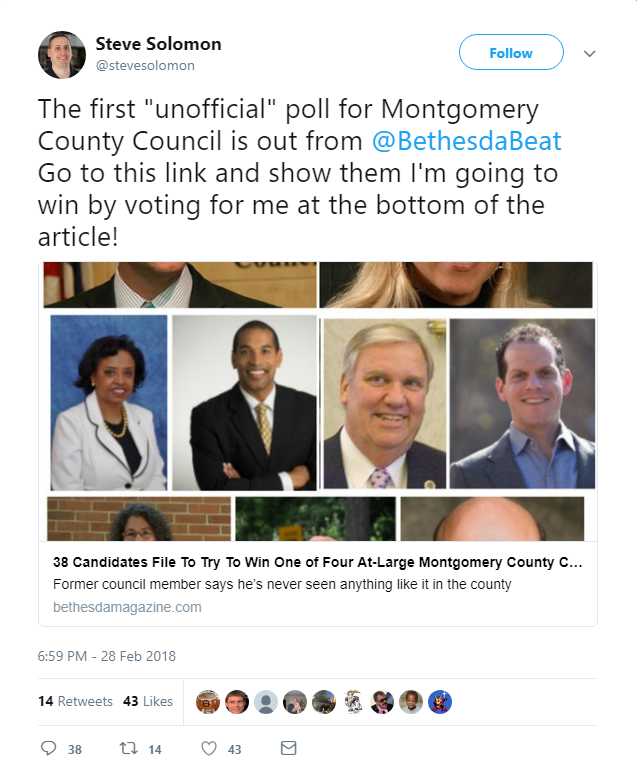 On Wednesday, Bethesda Magazine did an online poll on the Council At-Large race, which it admitted was “not scientific,” with SurveyMaker. The poll began making the rounds on Facebook and one political insider sent it to your author, breathlessly panting, “Unscientific, but very surprising!” Then a complete unknown, Steve Solomon, took the lead spot and folks started to understand just how unscientific this poll was. Solomon’s “win” was not an accident. He is a sports radio host and he encouraged his listeners to vote for him on both radio and Twitter. Now look. We do not absolutely deplore all online polls. They can be fun and buzzy, and if folks want to push buttons for kicks, that’s fine. But it’s absolute cross-eyed tomfoolery to see them as containing any merit. Candidates, listen up. If you spend your time pumping worthless ca-ca like this instead of phone banking, door-knocking and raising money, your chances of winning will be about as high as the coyote’s chances of catching the road runner. Now get back to work! In the most brutal campaign attack of the cycle, former County Council spokesman and current at-large council candidate Neil Greenberger is comparing the council to the Washington Redskins. Under current owner Dan Snyder, perhaps the most despised franchise owner in pro sports, the team has won just two playoff games in the last nineteen seasons. They are commonly regarded as the third-most dysfunctional institution in the Washington region after the White House and Congress. We don’t agree with Greenberger that the council is that bad, but as a Washington Post reporter who covered the Skins in their glory years, Greenberger’s take sure is amusing! We reprint his blast email below. On Jan. 26, 1992, Washington’s professional football team won its last Super Bowl. In the 26 years since, not a lot of good things have happened to that organization. It often doesn’t listen or care what its fans think. On Jan. 10, 2018, the first campaign financial reporting period will end for candidates seeking Montgomery County political offices. While candidates can accept contributions beyond the first reporting date, with at least 30 people running for the four available at-large seats on the Montgomery County Council, those that collect donations of support early in the campaign will prove to be the strongest contenders for this Super Bowl of elections. So, what do these two things have in common? In both Washington professional football and on the Montgomery County Council, there is a great need for better direction, better efficiency, more listening to what the “experts” regard as important and real plans for the future. In one of these cases, you can help: by supporting my candidacy for an at-large seat on the County Council and backing a progressive agenda that helps those in need and improves services while spending money efficiently and not raising property taxes over the next four years. Those directing Washington’s professional football team do not seem to have a game plan for long-term success. My campaign is based on doing the right things that will make Montgomery County a better place to live for our future generations. Those directing Washington’s professional football team have some very smart people offering advice on how to improve its situation—but the team leaders have opted to ignore that advice. The result has been years of failure. Over the past year, I have been meeting people throughout Montgomery County and listening to what they want to improve in the County, their neighborhoods and for the long-term future of their children. Those directing Washington’s professional football team do not seem to have a playlist for the future. In listening to Montgomery residents, I know the priorities for our county must be a public school system that strives to get better for students at all schools around the county—and moves ahead with big and innovative steps, rather than the goal of holding the status quo. We want development that plans for realistic school capacity needs, roads to support the development and parking spaces so all people in the county can enjoy these new projects. And we want things done efficiently, without the spiraling waste of tax dollars that has been the hallmark of our county for the past decade. Those directing Washington’s professional football team keep going to the same well when it needs more money: raising ticket prices, concession prices and parking prices—without regard to the burden it puts on its supporters. As a former Washington Post reporter and longtime County employee, I know where to find the waste in County government. And by using the county law (approved by voters) that allows one Councilmember to block an increase in property taxes, I will GUARANTEE that property taxes will not increase above the County Charter Limit (basically the annual cost of living) for the next four years. You may not be able to change the future of Washington’s football team. But you can make a difference in the future of Montgomery County. To commemorate Washington’s 26th anniversary without a Super Bowl since 1992, I am hoping you will contribute $26 to my campaign for the County Council before January 10, 2018. (Any individual can contribute up to $150, but right now, $26 will be great). It will lead to the changes you tell me you want in Montgomery County. And in this case, you get to call the plays. Former County Council spokesman Neil Greenberger, who is running for an at-large seat, has released a campaign video guaranteeing that if he is elected, there will be no property tax hikes in the next term. Greenberger cites a section of the Montgomery County charter that prevents property tax hikes above the rate of inflation unless all nine Council Members vote to do so. If only one member votes no, the tax hike would fail. The nine vote requirement is the result of a ballot question submitted by Robin Ficker which was approved by voters in 2008. While other at-large candidates have been skeptical of further tax hikes, none of them so far have taken as hard a line against them as Greenberger. By running for an at-large County Council seat and retaining his position as the council’s spokesman, Neil Greenberger is creating a troublesome situation for both the council and the public. That situation is rooted in the significant conflicts that Greenberger will now have between his two roles. As we have previously written, the position of spokesperson for an elected official – or in Greenberger’s case, nine of them – is a position of trust. Elected officials must believe that their communications personnel will represent their positions and actions fairly towards members of the public, who after all will determine if those officials are reelected. That’s hard to believe when the spokesperson is a candidate who is running for the same office held by the elected officials he is supposed to represent. In at least one case – incumbent Council Member Hans Riemer – Greenberger is running in the exact same contest. (Disclosure: your author is Riemer’s former Chief of Staff and regularly worked with Greenberger.) That means Greenberger is supposed to be trusted to represent Riemer fairly during his day job while he could very well criticize him or his positions on the campaign trail after hours. The same situation could apply to District 5 Council Member Tom Hucker, who may run at-large. This is not a hypothetical scenario. Greenberger is already running against last year’s tax hikes, telling MCM, “This county cannot take another property tax hike… I will guarantee no budget in the four years I’m in office will exceed the charter limit. That’s a guarantee.” He also told the Sentinel, “The number one thing is, no matter what their incomes, people are still feeling the pain of the big tax increases – actually the two tax increases of last year… And I don’t think they need any more tax increases in the next four years.” Your author has some sympathy for Greenberger’s opinions. But the fact is that all nine of the Council Members Greenberger represents in his day job voted for the tax hikes and those who are running again will be defending them on the campaign trail. And yet their own spokesman is contradicting them. There is more. Greenberger runs the council side of the county government’s cable channel, County Cable Montgomery (CCM). He even hosts his own county TV show. He is also a liaison between the council and Montgomery Community Media (MCM), a non-profit that covers the county and receives county funding. In those capacities, Greenberger will be in a position to influence the coverage his opponents – including those who employ him – receive. It’s a huge conflict. But Greenberger ignores that. According to the Sentinel, “Greenberger said he plans to continue to work his job while he campaigns for County Council, saying there is not a conflict of interest because his job is not political nor is he required by law to quit.” That’s a questionable contention at best. Many communications from elected officials to the public have a political dimension to them. Elected officials who issue communications making themselves look bad may not be elected for long! Neil Greenberger interviews one of his nine employers – and future political rival – Hans Riemer on his county television show in 2011. The natural reaction of elected officials who face the prospect of their own spokesperson publicly critiquing them is to stop using the spokesperson altogether. Think about it – who on Earth would want to employ a critic or outright opponent to write press releases about them? Here’s where the situation becomes problematic for taxpayers. Greenberger was paid $148,091 in 2016. If Council Members stop going through him and start relying exclusively on their own personal staff for communications, there is a possibility that his ability to perform his day job would be impaired. These are not garden-variety conflicts, folks. Greenberger’s compensation as well as the media outlets he influences directly and indirectly are publicly funded. That leads us to ask what safeguards will be put in place to prevent any potential use of public resources to benefit a specific candidate, especially if it comes at the expense of others. Greenberger has as much right to run for office as anyone else. He is also a merit staffer and can’t be fired for political activity after hours. But given the above facts, Greenberger should request a transfer to a less politically sensitive position and the job of council spokesperson should be converted to an at-will appointment. Should he fail to act accordingly, voters should consider his sense of judgment on this issue when they decide how to cast their votes.